Twitter. 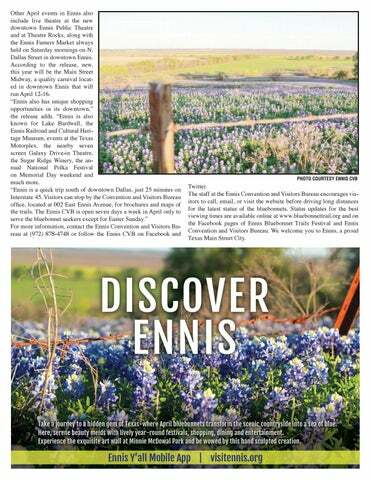 The staff at the Ennis Convention and Visitors Bureau encourages visitors to call, email, or visit the website before driving long distances for the latest status of the bluebonnets. Status updates for the best viewing times are available online at www.bluebonnettrail.org and on the Facebook pages of Ennis Bluebonnet Trails Festival and Ennis Convention and Visitors Bureau. We welcome you to Ennis, a proud Texas Main Street City.